With an underlying philosophy of "Listen, Process & Learn", we were kings of creating scrappy, real-time content based on emerging digital trends. 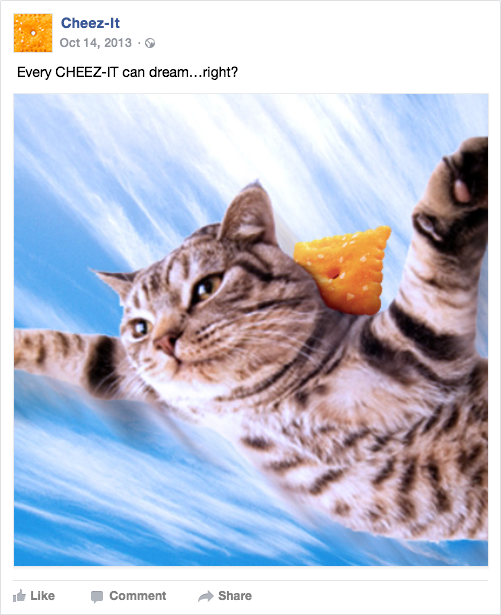 We worked across Cheez-It, Frosted Mini-Wheats, Eggo and Nutri-Grain to inspire consumer participation, deliver business results and build brands by following foundational principles for success. We focused our efforts on hi-volume, light-touch engagements; amplifying and building upon success while running larger iterative programs along with the ongoing conversation. 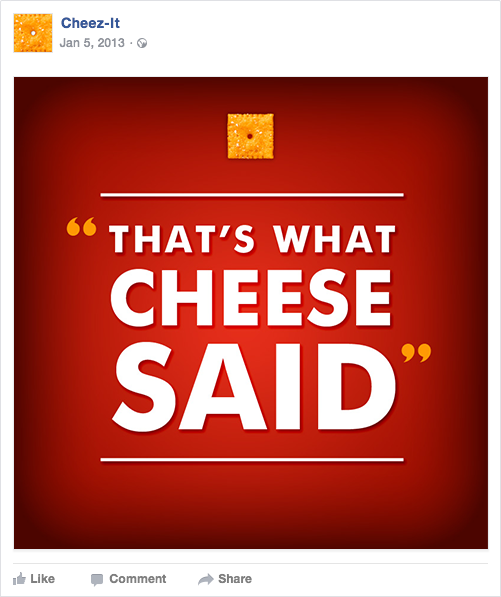 Cheez-It fans are passionate and quirky. All the content celebrated the brand through a unique lens that constantly pushed the brand’s perception of itself. Engagement increased for six straight quarters, with a 270% increase in one year. Total followers increased by 100%, with 70% of them being from organic activity. The Eggo brand is a kid-at-heart with a playful charm who brings laughter to the everyday. To encourage moments of togetherness and build the brand, we focused on the food in ways that everyone wanted to share while engaging with our core fans with small to medium sized engagements we knew they would find delicious. We increased our fan base and our engagement throughout 2012 and 2013, with engagment rates that rose 92%, conversation up over 1,000% and over a %100 increase in fans..
It’s not just we are what we eat, for this mom it is now we are what we create. Recipes are a special reflection of ourselves, and our families. We used promotions like The Great Eggo Waffle Off to become more relevant. Product promotions were fun, quick and geared towards our users. For the Eggo Drizzler's launch, we created custom waffle-works celebrating families in a way that encouraged them to have fun together.